The Academy’s drama therapy program is the most literal example of students trying on a new role. The goal of the program is not intended to help students become better actors. Instead, it provides them with the opportunity to re-write their own life’s script. It allows them to think and feel as someone else might. Then, they also express those emotions in a safe environment. Students become more self-aware and empathetic. Students enjoy on-stage experiences in our newly constructed theater room, equipped with a stage and professional lighting and sound equipment. A licensed therapist who also has an extensive background in film and stage production conducts these sessions. The highlight of the psycho drama experience is the Parents’ Seminar performances. 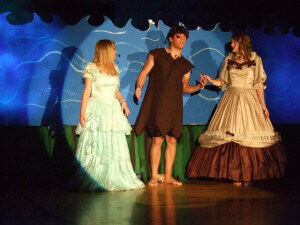 Held twice each year, the seminars include a full-scale theatrical production involving Academy students. Whether it’s performing on stage, choreography, costume or set design, lighting or sound, these performances become a showcase of student talent. Students tell us this opportunity to literally try out different roles gives them a thrill unlike anything they have ever before experienced. Learning to risk in positive ways and experiencing the thrill of success creates positive self image and memories that last a lifetime.